WASHINGTON – When the 116th Congress convenes in January, something notable will be missing in the Arizona delegation: As much as 73 years of collective experience on Capitol Hill. With the loss of some of its most senior members from the incoming Congress, the average tenure of a member of Arizona’s delegation has gone from just under nine years at the start of the 115th Congress two years ago, to just over five years heading into the 116th. While losing years of seniority might not be ideal, it does not necessarily spell doom for the delegation’s ability to get things done, according to an American University political science professor. “Unless you’re in leadership, in terms of party leadership or committee leadership … being a freshman member, a sophomore member, a junior member is really not that different,” said Meredith Persily Lamel. But Arizona lost one of the highest-profile members of Congress with the August death of Sen. John McCain, who was serving as chairman of the powerful Armed Services Committee at the time of his death. Experts said that loss will be felt. A look ahead at the 116th Congress that takes office next month. McCain spent nearly 36 years on Capitol Hill, serving in the House from 1982 to 1986, when he was elected to the first of six terms in the Senate. Fellow Republican Sen. Jeff Flake announced in October 2017 that he would not run for re-election after his one term in the Senate. When he leaves Washington this month, he will be taking a total of 18 years of House and Senate experience with him. Flake will be replaced by Sen.-elect Kyrsten Sinema, a Democrat with six years of House history. But she will be replaced by former Phoenix Mayor Greg Stanton, a true freshman on Capitol Hill. Rep. Trent Franks, R-Peoria, who spent nearly 16 years in the House, resigned in December 2017 in the face of House Ethics Committee investigation into charges of sexual harassment. Franks was replaced in April by Rep. Debbie Lesko, R-Peoria, who will return in the next Congress with less than a year under her belt. The picture is complicated by McCain’s replacement, Sen. Jon Kyl. 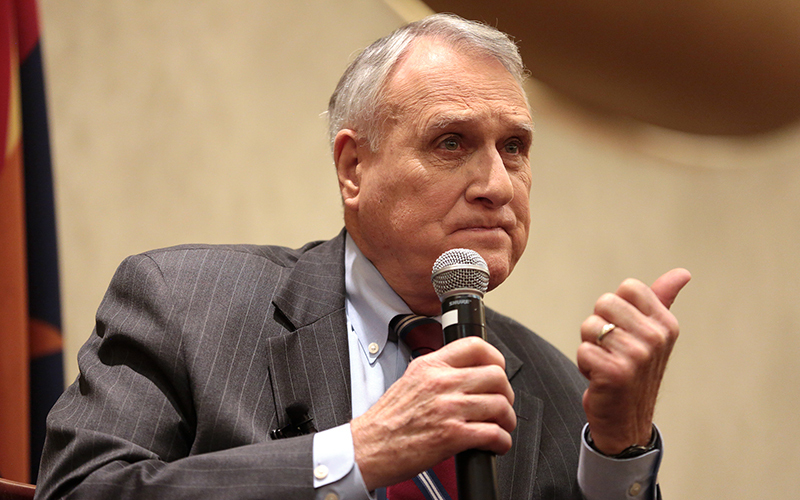 While he had 26 years of prior House and Senate experience when he was named to McCain’s seat, Kyl confirmed Friday that he will not serve beyond the end of this year. Gov. Doug Ducey on Tuesday said he would appoint outgoing Rep. Martha McSally, R-Tucson, to take over for Kyl on Jan. 1. McSally lost her bid for Flake’s seat to Sinema this year and while she has four years of experience in the House, it’s not the decades of experience Kyl brought to the job. And it means Arizona will have two freshman senators next year. But Democratic political consultant Bill Scheel said fresh faces may not necessarily be a bad thing for the state. “I think in many respects we’re going to have a delegation that’s more focused on Arizona issues and less focused on national posturing,” Scheel said. In one case, the incoming member will have more experience than the outgoing one. McSally is being replaced after two terms in the House by Rep.-elect Ann Kirkpatrick, a Democrat who comes to the job with a total of six years in the House divided between two previous stretches. In addition to her experience, Kirkpatrick brings something to Washington that Lamel says is just as important: An electoral victory in a swing district. Lamel said a House member from a competitive district can draw “attention” from party leaders, who want to hold that seat. They may try to strengthen such lawmakers’ hand by putting them on powerful committees that will help members raise funds when it comes time for them to run for re-election. Purdue political science professor Valeria Sinclair-Chapman said senators usually stand out as leaders and that with McCain gone and his long-term replacement uncertain, that could mean increased prominence for Sinema. Scheel does not expect that person to be Sinema, noting that more-liberal congressional Democrats and those running for president in 2020 are likely to make the majority of headlines in the 116th Congress. The new members may not always be in the media spotlight, Scheel said, but they should be able to deliver more for Arizonans. While McCain had become an important figure in foreign policy and both he and Flake where high-profile Republican critics of President Donald Trump, Scheel said they had become disconnected from the state they represented. “There will be fewer Arizona senators quoted in the New York Times and the Washington Post, but I don’t think that’s necessarily detrimental to Arizona,” he said. -Cronkite News reporter Ian Solomon contributed to this report.